"The girl is not dead, but sleepeth." The Gospel read at today's Mass is one of several accounts of our Lord raising people from the dead. We have this account of the young girl in a couple of different Gospels, and we also have the account of Jesus resurrecting the dead son of the widow of Naim, and also that of Him bringing Lazarus -- the brother of Martha and Mary -- back to life after four days in the tomb. The fact that our Lord was able to do this on these various occasions helps to strengthen our belief in His divine power. Modern people might otherwise scoff, and assume that He had simply encountered someone in a coma or a catatonic state and cured them of their ailment -- but that He hadn't really brought them back to life. The multiplicity of these events reassures us that, in fact, He really did have the power to call back the dead from beyond the grave. 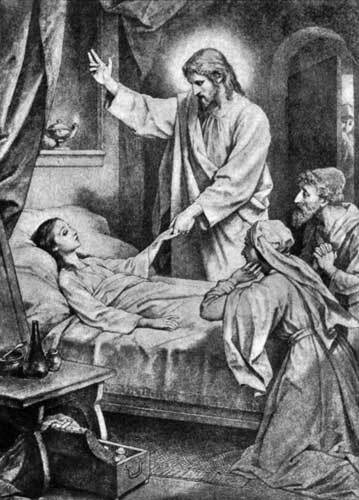 To remain skeptical, you would have to believe that in his travels Jesus encountered these various people who just happened to be in a coma, and whom Jesus alone was able to cure. That in itself would seem pretty miraculous, but would still not explain how he brought Lazarus back after he had been dead long enough to start smelling dead! But, there is more to these resurrections than simply a display of the miraculous power our Lord was demonstrating in a variety of other ways. The idea of "resurrection" was significant for several reasons. First of all, the doctrine that there would be a general resurrection of the dead on the Last Day, had become an important consideration of those who closely held God's laws during that very difficult period in Jewish history before and around the time of Christ. Those of you who have been following the reading outline we publish in the Parish Bulletin may have noticed this in the Book of Machabees. This book was written only a century or two before Christ, and in it we read that several of those who suffered martyrdom and persecution did so in hopes that, "The King of the world will raise us up in the resurrection of eternal life, since we are dying for His laws." So, to the observant Jews, the power of resurrection was something that they identified very closely with God. And in this way, some of them came to follow our Lord. Secondly, the reality of these resurrections performed by our Lord helped to prepare His disciples for the idea of His own resurrection. Particularly those disciples who did not actually see Him after His resurrection and who had to rely on the testimony of others -- and we can put ourselves in this category -- these additional testimonies by a variety of witnesses help to reassure the weakness of our own faith, that our Lord did indeed rise from the dead Himself on Easter Sunday. Thirdly (and lastly), all the biblical accounts of resurrection ought to cause us to ponder our own resurrection. As Catholics, we know that on the Last Day, all of the dead will rise -- not just those kept the Commandments and did their best to glorify God in this world -- but even those who lived very bad lives will rise. All of us will be restored with an eternal physical body. Man is a creature who is supposed to be made up of body and soul -- the body without the soul is a dead body; the soul without the body is incomplete. To those who enter into the reward of heaven, their resurrected bodies will be a source of happiness and further glorification of God's goodness. But those who enter into the punishment of hell will find that their resurrected bodies will be an additional source of torment -- a reflection, actually of God's justice. So, there is an exhortation here. As Saint Paul says, we have a choice to make: we can either "mind earthly things," and be "enemies of the cross of Christ"; or we can "look to the Savior, our Lord Jesus Christ, who will reform the body of our lowliness." We can make the choice, as he says, to "be recorded in the Book of Life."